I have heard much good about this Leatherman Piranha tool. I just got this and I am pleased for sure. Words cannot express how formidable this tool is in combination with a plier or a multi-tool. This in combination with a Victorinox SwissTool is formidable. I am very interested in small tools that can be used in combination with a multi-tool today and this is one of the best in my philosophy. It is possible to make a notch or do different technics without a second key but this may damage or break a device. The Piranha is made of thick steel with several functions on it that would make this a strong contender. This could be used in combination with many Wenger and Victorinox SAKs as well. Please take a look on my SwissTools page with underpages. 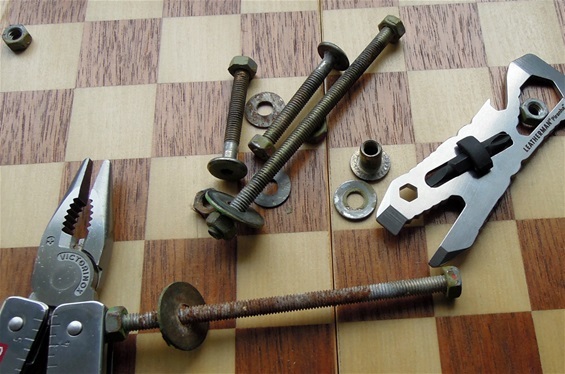 I did mention that it is possible to manage with just a multi-tool with plier on two nuts. Everyone knows that it is very difficult if the bolt with nuts is stuck. If you use the plier on one side then the other side will just turn. If you have a multi-tool with a metal file/saw then file a notch across the nut. Use a coin or a metal thingy to hold and then use the plier to open or tighten. There are other possibilities as well. This problem mentioned is erased with the Piranha in combination with a multi-tool. 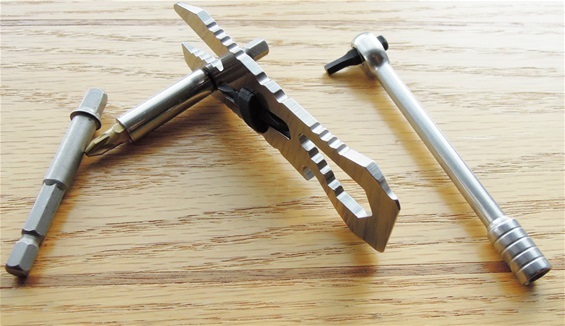 You can also use the universal wrench on the Wenger knives, it works well too. With the Piranha you get some more stability on a bit larger tasks. It is only the imagination that can stop the versatile use of the Piranha. I really enjoy the victorinox Ratchet and this can be used in combination. The bit opening can be used for very many tasks. The Piranha got a perfect fit for the F connectors for coaxial-cable. It is not easy sometimes to do the last turn with the fingers when connecting it to the antenna.It need to be firm but not too tight. The last half-turn with the Piranha works well.